Announcement MicaMagic Pottery for ceremony and holy food. Art to feed the hungry heart: New Mexico Mica Clay Pottery, Felt Bags & CatCave Beds, Raven & Day of the Dead Ceramics. All made by me, for you, with the intention: "When it's real, art can heal." Magic lives here. Open all night, the Sacred Heart Cafe is a quiet place to browse and dream and conjure. From a recent customer: "PattyMara is an amazing seller, and everything she makes is of the highest quality. If you're debating getting an item from her, stop and just get it! You'll have no regrets and much joy from her sacred art!" MicaMagic Pottery for ceremony and holy food. Art to feed the hungry heart: New Mexico Mica Clay Pottery, Felt Bags & CatCave Beds, Raven & Day of the Dead Ceramics. All made by me, for you, with the intention: "When it's real, art can heal." Sugar Skull Urn of Mica Clay Custom Colors and Knobs. Patty customized the back of the plate for a friend. My friend loves it! I love it too! These salt and pepper shakers are just so dang cute! I ordered two of Patty's copaleros. This one is the more rustic of the two, unglazed and without a handle. It has the look of being a great archaeological discovery but with the advantage of being new. Both copaleros are exquisite works and convey an inspired feeling of being more than just practical objets d'art. The clay itself is also fascinating just to look at. Also to mention, the bowl of the copalero/chalice provides a very good "containment" effect in enhancing the burn of whatever is inside it. Both copaleros arrived beautifully eco-wrapped with a handwritten note and colorful information cards also. A wonderful, lasting experience all around! This copalero chalice is truly museum-quality fine art. The details are exceptional: some of the details come from Patty the artist, and some are from the clay and fire -- a very stunning trinity of cooperation! I purchased two copaleros (this one glazed and with a handle) as housewarming gifts for my new home. I requested a special intention (house blessing) from Patty, as she inlaid the precious stones, and this made all the difference, as the house blessing is truly locked into my subconscious now, with cumulative effect every time I burn substance in the copaleros. I plan on ordering more of Patty's beautiful work in this unique, health-giving clay. Recent bounty from my kiln. Burning white sage in honor of Brigid on Imbolc, Candlemas. PattyMara's Sacred Heart Cafe offers MicaMagic pottery, ceramics & fiber art, made by me for you. My Sacred Heart Cafe serves "Art to feed the hungry heart": MicaMagic vessels for ceremony and savory cooking and baking. 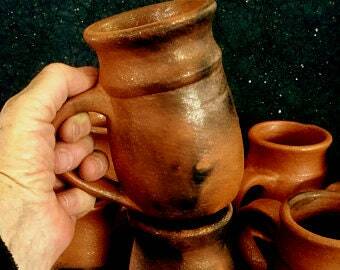 My pottery is both ceremonial & functional~it is healthy for your body & soul. What lights me up and fuels my passion is the glittering micaceous clay of northern New Mexico. I am crazy good at fulfilling custom requests. I can infuse a blessing & burning bowl with your intentions and prayers. I can help you navigate the difficult journey of Grief to make a cremation urn that reflects your loved ones life and brings you comfort in their absence. I make color saturated ceramics to celebrate a wedding, anniversary or birthday with a custom inscription or image. I am fond of El Dias de los Muertos, the Days of the Dead, with its dancing skeletons and grinning sugar skulls. Raven, Fox and Owl appear often. I am crazy good at custom orders. Try me. My home & studio are perched above the Rio Grande near Taos, New Mexico. Raven, owl, fox and bear live here. I attend river church with devotion and pray with rainbow trout. I learned to be a potter in the early seventies at UC Santa Cruz and still sign my pots "Patch"- my college nickname. I learn to felt wool when we moved to New Mexico in 2010. 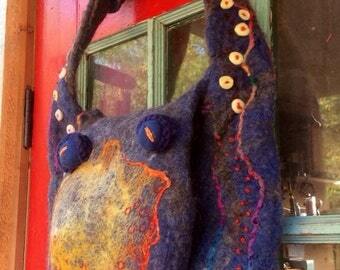 CatCaves and messenger bags/purses and mixed media clay/felt sculptures emerge from my fascination with felting. I make real art, and when it's real, art can heal. I am a mica clay and fiber artist living in the Rio Grande Gorge in northern New Mexico, near Taos. I make magical mica pots for ceremony and savory cooking & baking. Raven, Owl and Fox find their way into my ceramics and felt art. "PattyMara is an amazing seller, and everything she makes is of the highest quality. If you're debating getting an item from her, stop and just get it! You'll have no regrets and much joy from her Sacred Art!" I want you to be absolutely thrilled with your purchase. Let me know if you have any concerns about your order. I will refund any purchase if it is returned to me in the condition you received it, within two weeks after delivery. I accept Paypal, all Credit Cards through Etsy and postal money orders. Custom orders must be paid for before I make and ship them to you. See additional information below about custom orders. All shipping to USA is USPS-Priority, Parcel Select or First Class, depending on size and location, with delivery confirmation tracking. FedEx is also an option. International shipping through USPS is available for most of my listings. Wholesale orders: I make all of my art, with no helpers, therefore wholesale orders are possible if time permits. I can offer a 20 - 30% discount based on quantity ordered. However, I'd love to hear from you and will do what I can to fill your request. I have over forty years of experience making custom orders for individuals and nonprofit/corporate clients. 1. You contact me, and we talk about what you are envisioning. I can let you know what is possible, and will strive to create your heart's desire. 2. We work together to create a design agreement which specifies the colors, design imagery, size, due date, cost, shipping. When we have come to an understanding about this design agreement, I will list a custom order in my shop just for you. 3. You place the custom order listing in your cart and send payment. 4. When I receive a notice that you have completed the payment transaction, I will begin the order and send it to you before or by the due date, as we agreed. 5. If you are not satisfied with the final art, talk to me. I will do whatever I can to assure your satisfaction, unless it involves something different from our design agreement. My customers in the past have been very happy, even ecstatic, about their custom orders, so I have great confidence that I can include you in that happy group.